I think this may be rivaling the Unit leader for my favorite of the bunch! I used the hammer which was intended to be the unit leader weapon and ditched the shield entirely - choosing instead to use the armoured gut plate of a Skorne Heavy warbeast in its place. 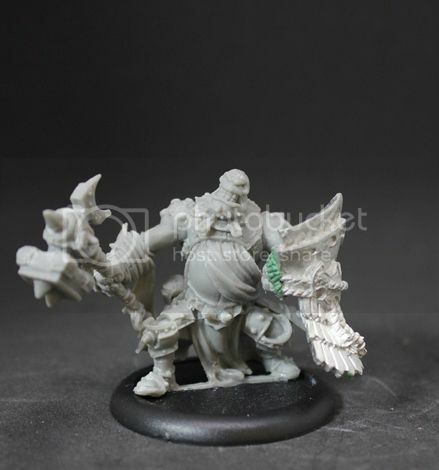 The proportion of this fits real nicely with the stout "squat" posed warder bodyand between the shield and the HUGE hammer it gives the figure a real sense of visual weight. To add to this I removed the vertical spikes form the top of his head which helps to further establish the visual movement in this figure as wide and horizontal. 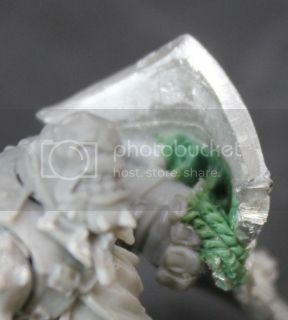 Looks pretty mean and adds variety among the unit faces (5 models only 3 different face sculpts). In order to make the shield make sense I had to sculpt the strapping system on the inside as well as carrying the rope detail from the front back around the side and into his clutched hand. Sorry that the picture isn't awesome but I think you can see the part that is most important in making this improvised shield work! He just looks tough so I am genuinely pleased. 4 down only 1 to go - see you tomorrow with the final guy and a group shot!